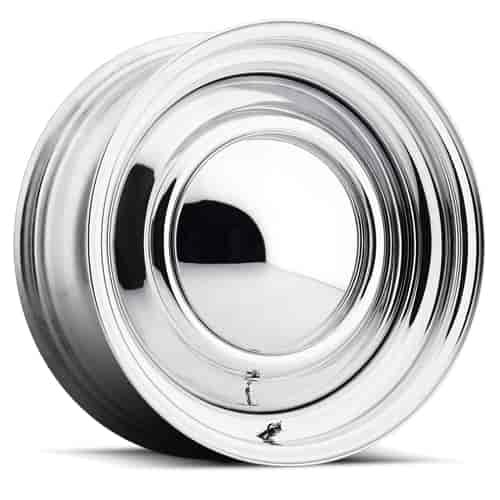 Cragar Chrome Smoothie Wheel Size: 15" x 8" Bolt Pattern: 5 x 4-1/2" & 4-3/4"
Wheel Vintiques 10-581204 - Chrome 10-Series Smoothie Wheel Size: 15" x 8"
American Racing VN315804 - VN31 Series Smoothie Steel Wheel Size: 15" x 8"
Cragar 313 Series Chrome Smoothie rims are sure to turns heads with their classic smooth, nostalgic look. Featuring a two piece steel construction, the 313 series wheels will exhibit strength and durability over time. Smoothie wheels are available in many sizes and bolt patterns for specific fitment to your project. 313-5805 is rated 5.0 out of 5 by 3. Rated 5 out of 5 by coolKen from Economical old school looking wheel. I bought these to replace my Torque thrusts, not wanting to drill screw holes to mount drag slicks. they weigh about 6 # more than the TT's but have gotten nothing but raves about them at the strip. Rated 5 out of 5 by Lyle1486 from They look great on My 1934 Ford Coupe. I would recommend them to anyone. Rated 5 out of 5 by davespowerequipment from These wheels are exactly what I wanted. They are top quality for a reasonable price. My truck looks great! yes the center cap is included.